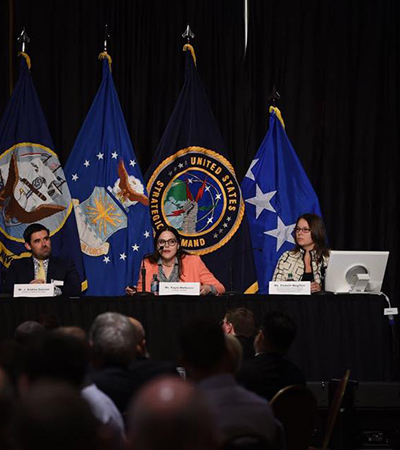 On August 2nd, Space, Cyber, and Telecommunications Law Program Executive Director Elsbeth Magilton represented the Deterrence and Assurance Academic Alliance (DAAA) at the Annual U.S. Strategic Command (USSTRATCOM) Deterrence Symposium in front of 750 people, including the USSTRATCOM Commander General Hyten and multiple generals from the US military and those of our allies, featuring impressive student research the Alliance selected to highlight at this larger conference. Last year the College of Law joined with the University’s Political Science department to co-host the annual Deterrence and Assurance Academic Alliance spring conference this March. The USSTRATCOM DAAA harnesses the work of academics and researchers, asking them to collaborate with both one another and with individuals inside USSTRATCOM to think about deterrence in new and challenging ways. The DAAA is an alliance made up of over 40 academic institutions focusing on the modern complexities of assurance and deterrence.